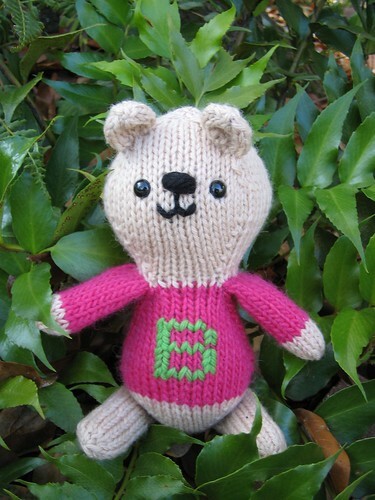 This bear was made for my babysitter's niece, Bailey. In other news, Schecky had a great night last night (ask me how much I am loving the steroids  g'head, ask me!) and is back in school today. Which is nice because I've got more knitting to do, and a little beaded tree to finish. In further news, I am all caught up with my blog reading, and am (insert deep breath here) preparing to tackle my email soon*! *Doing what I can, when I can, in a way that makes me happy! Sweet baby bear. And so glad the Scheckster is feeling better. Those bears are the cutest. I'll bet they're in great demand. Cute, cute bear! I love her pink sweater with the green B. Caught up on blog reading? Boy, that's a task. I just got through wrestling with my emails. I think I need a nap now. Boy, my niece Bailey would get such a charge out of your wee bear! Also, I don't think I've thanked you enough for the wonderful Square Bear you made me. He is my little DVD-watching, Christmas-card-writing companion and cheers me endlessly.